Whether you're an SMB with private cloud hosted applications or a larger organization across multiple sites and countries, PaperCut products have the flexibility to leverage your existing infrastructure and practices. The choice is yours: operating system, print configuration and brand of printer. The simplest way to deploy PaperCut is to install directly onto a site's print server. For any small organization such as a school or business, the implementation doesn't need to be any more complex than this. 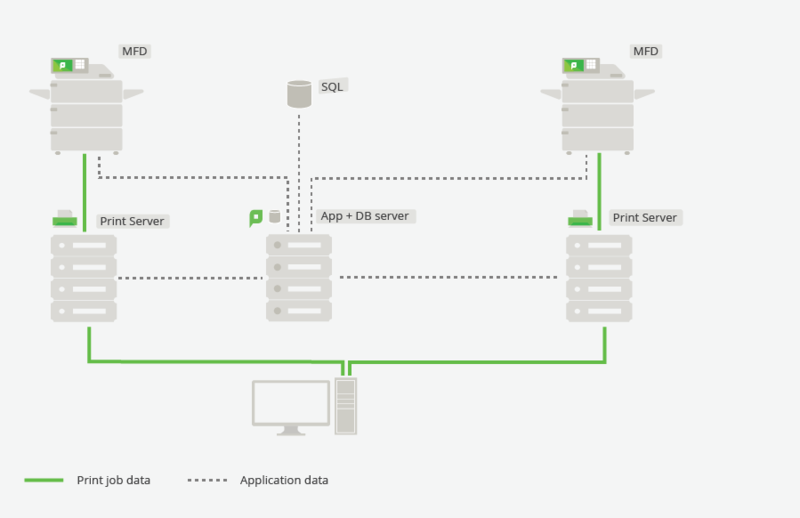 Single Application Server, Single Print Server. Planning to grow? For organizations that have more users, more offices and an increased emphasis on high availability, a site-server or multi-site, multi-server deployment can be added to your existing install to provide business continuity. It is common for sites with a single physical location to have multiple print servers. iOS printing - Supporting printing from iOS devices may be deployed using a Mac server to compliment a Windows print server. Separating departments or users - Schools dividing admin from general staff/student printing or organizations splitting business units. Each print server will need to be installed and configured to communicate with the Application Server, as a Secondary Print Provider. Many smaller commercial and professional organizations don't have on site IT support to maintain print network infrastructure, and rely on an office administrator to simply connect notebooks and desktops to the office printer. You can print directly from your computer to a printer, without the need for a print server. Not all multi-site installations rely on a print server at each site. This may be because the sites are small and don't warrant the resources, or because they are quite large and have resources centralized in a data center or on a private cloud. If all printing is centralized through a single Application Server, single print server installation, the installation is the same as a single site with a single server. Using the PaperCut Direct Print Monitor (a small monitoring component) on the desktops in ‘Site B' will allow for the robust WAN consideration above to be removed. Print jobs are sent directly from the desktops to the printers avoiding a trip back to head office to be accounted for. The Direct Print Monitor can be installed manually or deployed as part of an organization's management of these desktops, and adds no additional overhead to the management of the PaperCut Application at the main site. To ensure continuity of print services, PaperCut Site Server is recommended during a network outage between a site and Application Server. 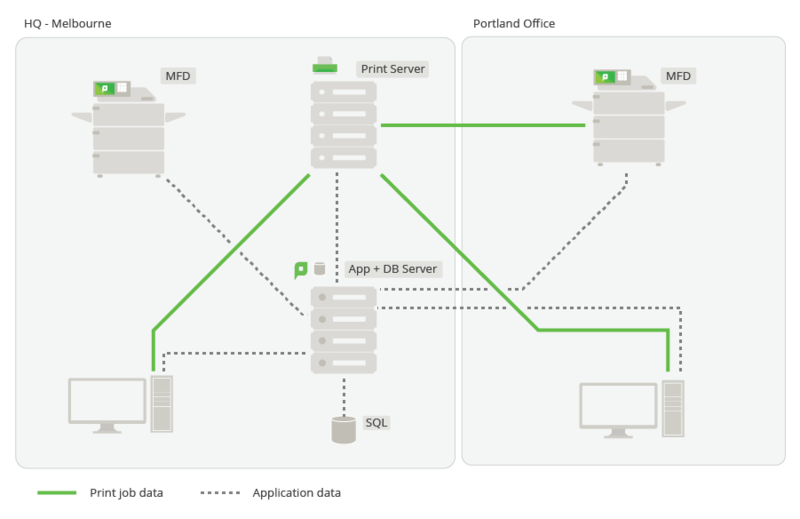 PaperCut Private Cloud deployments allow multi-site installations to centralize their Application Server in a data center. 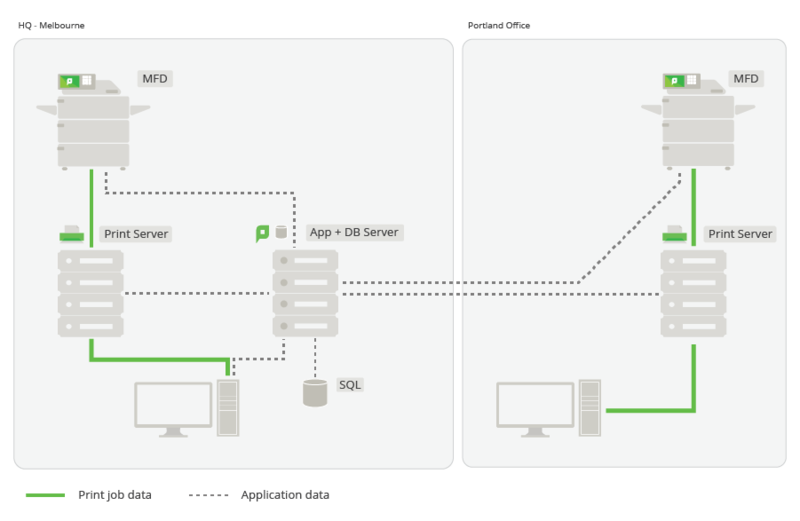 No single site is reliant on the other site being available, rather both sites only require an internet connection to connect to the Application Server. Print servers deployed into remote sites allows for print jobs to be spooled locally. This reduces the need for jobs to be sent back and forth from a centralized print server to the remote destination printer. In these cases, multiple print servers are deployed to handle load distribution and minimize bandwidth requirements. This design is supported through the deployment of Secondary Print Providers on each of the print servers. Allowing print jobs to remain locally spooled, light-weight transactional data and control information is transmitted between sites. The PaperCut Site Server would add significant continuity in this design, installed onto one of the existing print servers. Providing local support for Application Server functions should the link between Primary and Secondary sites be unavailable. PaperCut can be installed into a multiple site organization, as if each site itself were a separate installation of PaperCut. 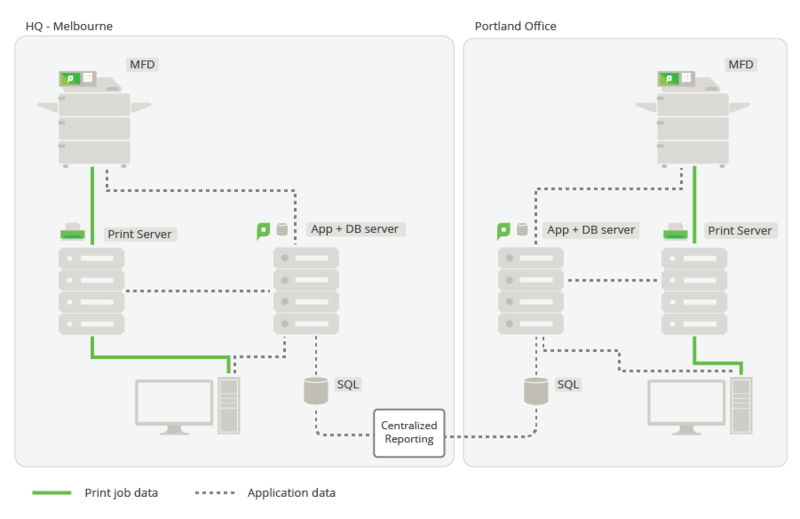 PaperCut has the ability to link separate Application Servers together for reporting purposes. Each individual site then has the ability to function and be administered autonomously, relying on the links between the sites only when there is a need to run a report from the centralised reporting service. Individual autonomous sites would use one of the previous installation options. Where an organization has many sites, the cost of adding a print server to each location just to support PaperCut can be cost prohibitive. Using the PaperCut Direct Print method of deployment, the requirement for infrastructure is removed as it tracks jobs from the point of origin (notebook or desktop).The Direct Print Monitor can be installed from a share to make deployment to each computer simple. Post offices, banks, construction sites and organizations that have a small number of desktops and printers per site, but a large number of sites may best suit this method. A Private Cloud deployment isolates applications and data from others, reducing potential cloud security risks. Private Cloud print server deployment. To gain regular visibility over your multi-server, multi-site network, PaperCut's Central Reports can be scheduled and emailed to your network Administrators. For more information on multi-site and multi-server configuration, please see Multi-Server and Multi-Site Deployments in the PaperCut Manual.